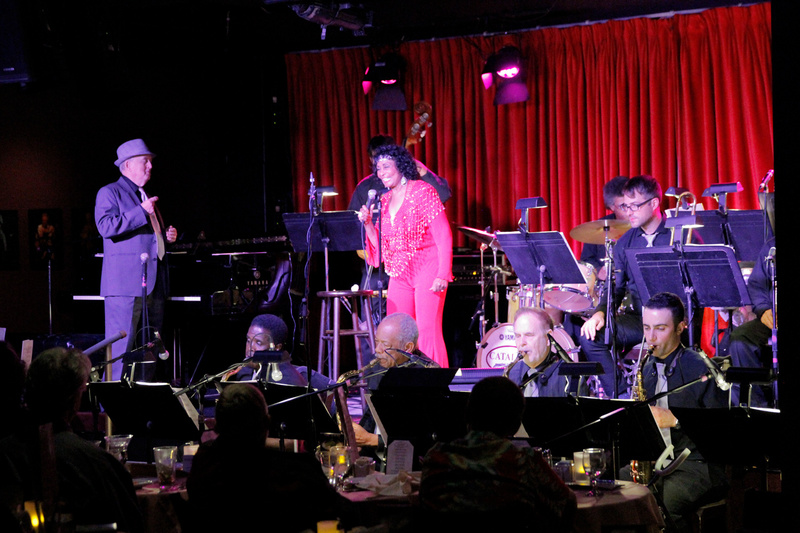 Our appearance at the LA JAZZ INSTITUTE FESTIVAL was incredible. At the conclusion many people came up to the bandstand to tell me that ours was the greatest band they had heard in twenty years of attending the Ken Poston event. My band and I are extremely proud of our performance and if you check the videos you will hear a small portion of our concert with outstanding solos by Ricky Woodard and Jeremy Lappitt. Thanks to Ken Poston and his staff for including the PMO in this star-studded event. The May 23rd appearance at the TYPHOON was equally potent including great solos by Bob Summers, Barbara Laronga and Juliane Gralle. As always, thanks to Brian and Yuko. Last Sunday we played at the world famous LIGHTHOUSE to a sell-out crowd and introduced new arrangements of "Song for my Father" and "Hoedown". This venue at the beach is special and thanks to Gloria Cadena for preserving the music. The "Gardens of the World" concert was outstanding. We played to almost 500 people and Ira informs me that they are still talking about us. We had spectacular solos from Barbara Laronga, Bob Summers, Nick Daley, Doug Webb and Pablo Calogero. A special thanks to trumpet subs Charlie Davis and Bobby Burns. As always, thanks to Ira for giving us the opportunity. On Monday, September 19th we will appear at the TYPHOON at Santa Monica Airport from 8:00 to 9:30 pm. Another great performance at the TYPHOON with soloists, Charlie Morillas, Charlie Owens, Rickey Woodard and Pablo Calogero. As always, thanks to Brian and Yuko. The "Century City View" has just published an in-depth article on Peter Myers. The Sunday concert at the Lighthouse was spectacular. We introduced new arrangements of "Nica's Dream" and "Tonite, Tonite, Tonite" (a Phil Collins mega hit). Loree and all of our soloists drew raves from the large crowd. Thanks again to Gloria Cadena for her support. Thanks to Ira and all the staff at BOGIES...another great night and Peter displayed his new tuxedo jacket. Unfortunately the E-Spot_Lounge had to be cancelled. at 7:00 pm. "We will tear it up!". Well..."Tear it up" we did. Our best concert to date. Loree was in great form and the large audience gave Rickey Woodard and the PMO a standing ovation. Many thanks to Ken Poston and his staff for making us welcome. We are pleased to welcome the fabulous Bobby Burns to the PMO trumpet section. The Lighthouse concert was spectacular. All of our renowned soloists were in great form. We played three wonderful sets to packed houses. Major thanks to substitute drummer Roy McCurdy, who perfomed magnificently. Once again, thanks to Gloria Cadena and the staff at the Lighthouse. WHAT A NIGHT! December 9th. Our concert at the Segerstrom Concert Hall in Costa Mesa was unbelievable. We played to a packed house and a number of our compositions drew standing ovations. The hall is absolutely magnificent and has incredible acoustics...what more can we say except thank you to the audience and to John Mangum, President and Artistic Director of the Philharmonic Society of Orange County, and all of his staff. Latest news...we are now under the umbrella of The Peter and Loree Myers Music Foundation, Inc. Thanks again to Gloria for our successful concert at the Lighthouse on February 4th. BTW, there have been some major changes to the PMO personnel...a new trombone section, a new saxophone and a new trumpet. To be specific, we welcome trombonists Charlie Morillas, Ido Meshulman and Craig Ware, saxophonist Keith Fiddmont and trumpeter Ron Barrows. Our best wishes are extended to our ex members (Jeremy, Alan, Nick, Juliane and Barbara). Our next concert will be at Bogies in Westlake Village on Tuesday, March 13th at 8 pm. Look forward to seeing you there. What a night at Bogies...everyone brought their 'A' game. Oustanding solos by Ron Barrows, Charlie Owens and Ido Meshulman. We are proud to welcome virtuoso saxophonist Louis Van Taylor to the PMO, while we wish Keith Fiddmont the best in his future endeavors. Since our last post we gave concerts at The Village Green, the MR. C Hotel and the Lighthouse, where, of course, we are always grateful to Gloria Cadena. 2019 got off to a great start with our concert at the Lighthouse on Sunday. We welcomed Barbara Laronga back to the trumpet section and she did a fabulous job. Once again, thanks to Gloria and all the staff at the Lighthouse. Our next concert will be at Bogies in Westlake Village on Tuesday, March 12th at 8 pm. Look forward to seeing you there..
BTW we will record our first and overdue album on Saturday, February 23rd. Well, we did it! Yesterday we recorded at Citrus College in Glendora, with chief engineer Tim Jaquette. The guys were great, the room was great and special thanks to my friend of over forty years, Bill Conti. He supervised the entire session for me. A privilege. Next concert at Bogies on Tuesday March 12th at 7:00 pm.